With major filming projects such as NBC’s Grimm (Seasons 1 and 2), IFC’s Portlandia (photo on left), and TNT’s Leverage shooting in Oregon all at the same time, it’s no wonder 2011 was one of the most lucrative years in Oregon’s film industry. Last year alone, the film industry brought in over $130 million for Oregon. The boost in economy was not limited to the Portland-Metro area. Businesses as far as southern Oregon and the Oregon coast are also enjoying the positive impact of having more productions filmed in the state. It would be interesting to note that Oregon’s relationship with the film and television industry has not always been smooth sailing. In the 1980s, Oregon was a popular film location for network movies of the week and coming-of-age films - such as The Goonies (1985) and Stand by Me (1986) - but the hot streak eventually simmered down. In the 1990s, another set of beloved made-in-Oregon movies — among which were The River Wild (1994), Mr. Holland’s Opus (1995), Free Willy (1993) and Free Willy 2: The Adventure Home (1994) — again saved the day and supported Oregon’s film economy through the 1990s. Not soon after however, filmmakers decided to move their productions to Vancouver, B.C., which has quickly become one of the major film-production centers in North America. This year, Oregon’s film industry is once again running in the forefront. Backed by state incentives, filmmakers spent hundreds of millions in Oregon in 2011 producing films, television shows, and TV commercials. With filming experience dating back to the silent film era, Oregon has consistently maintained its ebb-and-flow relationship with Hollywood. Over 400 feature films and television shows, as well as hundreds of commercials, have been shot in Oregon. As a result, the state’s local talent pool for crew and production support services is deep and wide. All that aside though, Oregon’s best attractions for filmmakers are its lush, green landscape which ranges from rugged seacoast, high mountain passes, magnificent waterfalls and rivers, stony lava beds, to its rain-slicked streets. To top it all off, Oregon’s famous city Portland also has some of the most charming and colorful residential neighborhoods. A filmmaker’s delight! Speaking of Portland, time and again, the city draws filmmakers to it more than any other Oregon towns. Scenic beauty aside, what constantly puts Portland on the movie-industry map is its “full-throttle, indie spirit fueled by industry devotees who seem not to care much about fame, fortune or the whims of the outside world.” Portland’s quirkiness (which reminds me of Austin, Texas) andpersonal devotion and passion for the art of filmmaking set the city apart from other Pacific Northwest locations. One of television’s newest series Grimm is set and filmed in and around the Portland area. After a successful first season, Grimm is again filming its second season in Portland. To celebrate its continuing success, on May 29, 2012, Oregon Governor John Kitzhaber, joined the cast (David Giuntoli, Bitsie Tulloch, Silas Weir Mitchell, and Russell Hornsby) as they kicked-off Season Two of NBC’s fairy tale procedural drama on the Grimm set. 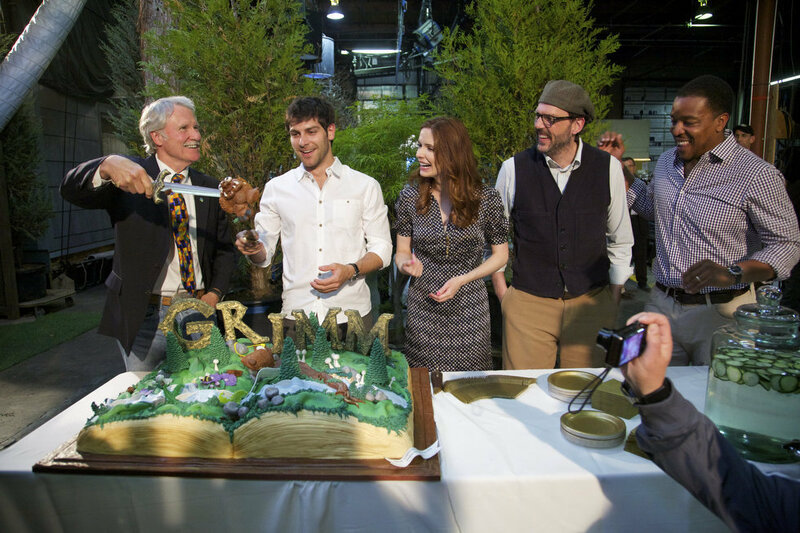 PHOTO CREDIT: Above photo of Oregon Governor John Kitzhaber and the Grimm cast (David Giuntoli, Bitsie Tulloch, Silas Weir Mitchell, and Russell Hornsby) at the kick-off party of GRIMM’s Season Two on May 29, 2012 is from here. Grimm is an eerie, supernatural crime drama that revolves around a police detective (played byDavid Giuntoli) who has the power to see the Brothers Grimm fairy-tale creatures hiding out as humans, something a normal person can’t spot. The show combines procedural crime drama with mythology, and has been “the little show that could” for NBC, said Bruce Evans, senior vice president of programming for the network. PHOTO CREDIT: Above photo is a screenshot from Grimm’s pilot episode, filmed on location in a residential neighborhood in Portland. Productions filmed in Oregon in the past makes an impressive list that includes Twilight (2008),Into The Wild (2007), Gone (2012), He’s Just Not That Into You (2009), Mr. Brooks (2007), and more. Before writing this article, I’ve never seen a single episode of Portlandia. But for the sake of research, I Netflixed it the other night and was surprised at how original, quirky and funny the show is. Portlandia is an award-winning (Peabody Award) satiric sketch comedy television series. And yes, it is actually set and filmed in Portland and its surrounding areas. Portlandia‘s cast includesSaturday Night Live cast member Fred Armisen and Carrie Brownstein, lead guitarist and singer for Wild Flag. PHOTO CREDIT: Above still photo from Portlandia’s Episode 1, Season 1 is from here. “Portland, I think, is a city that feels very good about itself. But it’s very sensitive, and people go to extreme measures to show how nice they are,” shared Brownstein in her interview with NPR’sFresh Air. PHOTO CREDIT: Above photo of Mayor Sam Adams and the Portlandia cast (Fred Armisen, Carrie Brownstein, Kyle MacLachlan as the fictional mayor of Portland) is from here. PHOTO CREDIT: Above screenshot from Portlandia features Mayor Sam Adams in a special appearance as the show’s fictional mayor’s assistant. As of March 2012, Portlandia already had 16 episodes produced and aired for its first two seasons. The Independent Film Channel recently announced a third season which will include 12 episodes and will premiere in January 2013. Portlandia has filmed and continues to film throughout Portland and its surrounding areas. Below is a brief look at a few of those filming locations. Portlandia charmingly shows viewers the wackier sides of life in Portland. Each clip in the series is filmed at a real location in and around the city. One of my favorite sketches is the “The Deuce Hotel” (in Episode 5, Season 1, currently available on YouTube). For this episode, Portland’s ACE Hotel stood in for the fictitious Deuce Hotel. PHOTO CREDIT: Above screenshot of Portlandia’s Deuce Hotel was filmed on location at the ACE Hotel Portland. ACE Hotel is a chain of hip and trendy hotels headquartered in ... you guessed it ... Portland. It has hotels in a few other major cities around the country, including New York (ACE Hotel New York is on the Reel-Scout’s location database in case you want to check it out), Palm Springs, and Seattle. Known as “the country’s most original” hotel, each ACE hotel is styled and furnished to reflect its location. ACE Hotel Portland, also featured on Reel-Scout’s location library and listed on theNational Register of Historic Places, is the former Clyde Hotel where Drugstore Cowboy (1988) was filmed. 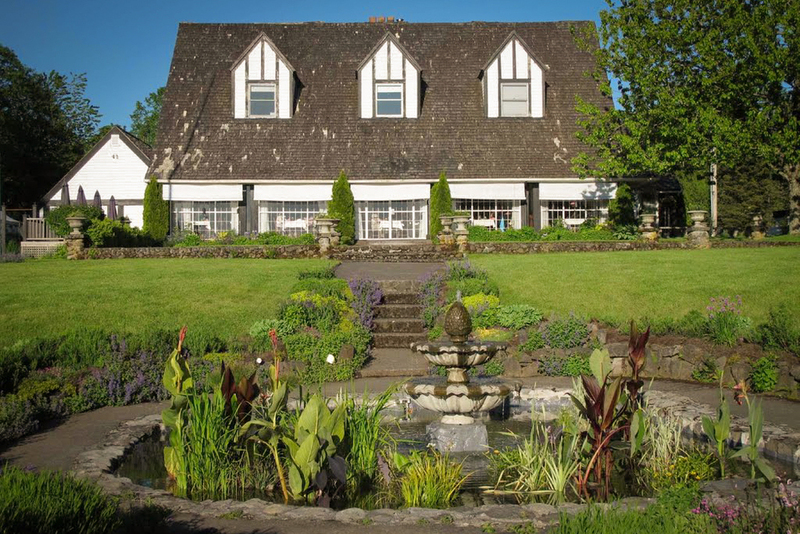 PHOTO CREDIT: Above screenshot of Portlandia’s “Farm” episode was filmed on location at The Gilt Club in Portland. Located in Portland’s Old Town, The Gilt Club surprisingly was not the first location of choice for the scene. Portlandia director Jonathan Krisel wanted a list of diners to look at as possible locations for “Farm.” But the location scout threw the Gilt Club into the mix, even though it’s not a diner. And in the end, “the director chose us,” Dunn says. The outdoor patio seating area of Firehouse Restaurant was the setting for Portlandia‘s “Whose Dog Is This?” sketch (Episode 1, Season 1). The show’s producers love the restaurant so much they came back to Firehouse to host a special luncheon for the cast and crew after Season 2 filming was over. Portland’s independent community center/bookstore In Other Words is the film location ofPortlandia‘s hilarious “Women & Women First Bookstore” sketches (such as “Feminist Bookstore” and “Customers Only”). In the show, In Other Words stands in for “Women and Women First Bookstore.” In real life, In Other Words is a non-profit, volunteer-run, feminist community center. Their mission is to support, enrich, and empower the Portland feminist community through literature, art, and educational and cultural events. In Other Words is also a book store, a lending library, and a venue for feminist events all rolled into one storefront. PHOTO CREDIT: The above screenshot of Portlandia’s “Feminist Bookstore” sketch was filmed on location at In Other Words Community Center and Bookstore. And now, let’s revisit an oldie (if you consider four years is a long time) but goodie phenomenon called Twilight (the first installment of The Twilight Saga) which was also filmed in Portland and its nearby towns. Like Grimm, Oregon’s dark and lush natural beauty is one of the main reasons whyTwilight producers decided to make the movie in Portland. Madison High School, Multnomah Falls, Oxbow Park, and the town of Corbett are among the many locations used for the rainy, ominous setting of Forks, Washington. Portland’s Madison High School was the setting for several of Twilight‘s high school interior shots (such as the cafeteria, science classroom, and hallways scenes). PHOTO CREDIT: The above is a screenshot of the cafeteria scene from Twilight was filmed on location at Madison High School. For the exterior shots of the high school, Kalama High School stood in as Forks High School. 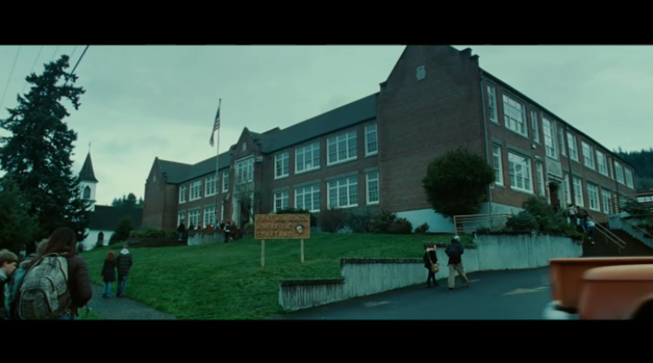 PHOTO CREDIT: The above is a screenshot of a scene filmed at Kalama High School (used for the exterior shots of Forks High School). 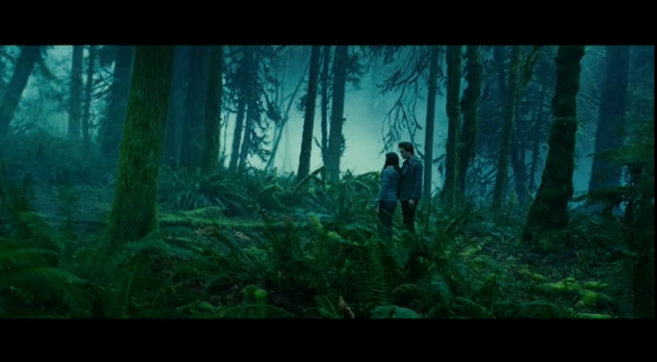 Gorgeous, woodsy Multnomah Falls and Oxbow Park are where Bella and Edward share some of their intimate moments. PHOTO CREDIT: Above Twilight screenshot is of a scene filmed in the woods of Oxbow Park where Edward and Bella have their rendez-vous. The Viewpoint Inn on the historic Columbia River Gorge was the film location for the prom at the end of the movie. Last year, the inn was destroyed by fire and it's unclear whether the owner can afford to rebuild the historic landmark at this time. Needless to say, Twilight fans are devastated. PHOTO CREDIT: Above screenshot is of the prom scene filmed on location at the Viewpoint Inn. Image of Viewpoint Inn (before the fire) via Google. Twilight was the first No. 1 box office movie filmed in Portland. Almost $20 million of the production’s $37 million budget was used during filming in the Portland area. Filming also took place in other Oregon’s locations including Vernonia, St. Helens, and Carver. The diner scene with Bella and her father was filmed at The Carver Café, a small, old-fashioned diner in the town of Damacus. The cafe prides itself on being a “dying breed” kind of restaurant and has been in operation since the 1950’s. On their experience being a film location for the blockbuster movie, the owners were exuberantly enthusiastic. “Having Twilight filmed at Carver Café was an unforgettable experience! We never dreamed that something this awesome could happen at our restaurant,” shares the owner Kris Stafford on the restaurant’s website. 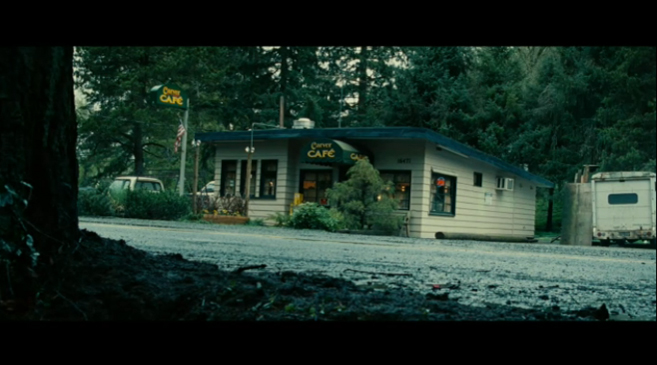 PHOTO CREDIT: The above is a screenshot of The Carver Cafe from Twilight. For its starring role in Twilight, the production team did some interior remodeling to The Carver Café. They added wood paneling, repainted a few things, and hung up various paintings and historical photos of the city of Forks. Image of Carver Cafe via Google. During the remodeling and filming periods, The Carver Café stayed closed to the public. When the production finished, the owners Sarah Boden and Kris Stafford decided to keep the restaurant’s new look - just as you see it in the movie. The filmmakers also left behind photos and many interior decorations from the set, as an expression of their gratitude. Today, The Carver Café is still in business. Starring in Twilight has generated much publicity and interest for the restaurant. Tourists and customers love to sit at the table where Bella and her father Charlie sat in the film. 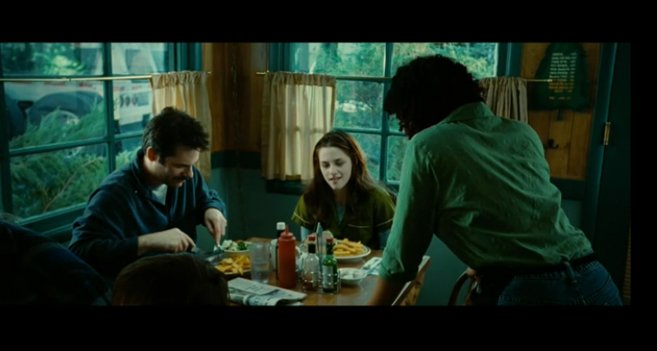 PHOTO CREDIT: The above is a screenshot from Twilight filmed on location at The Carver Café. As a Twilight and Portlandia fan, I can’t wait to visit Portland one day to embark on my own personal movie location tours of these two productions. Promise to document each step of the way and photograph all the famous filming spots for you, Dear Blog Reader. Unlike many other states’ programs, Oregon’s incentives are cash rebates as opposed to tax credits. This means productions get their checks quickly and efficiently. Oregon’s generous incentive programs includes a 20% rebate on Oregon-based goods and services, and an additional cash payment of up to 16.2% of wages paid to production personnel. Additionally, there is no sales tax on goods and services in Oregon which in turn immediately saves filmmakers at least 7 to 8 percent. The Oregon Film Office’s mission is to foster the state’s film, video, and multimedia industry. It also aims to increase the industry’s revenues, profile, and reputation within Oregon as well as internationally. The Film Office features several collections of Oregon’s locations on their website, including many of the state’s most scenic roads, the filming locations of TV series Leverage, and a beautiful tribute video to movies filmed in Oregon. For more information on filming in Oregon, visit the Oregon Film Office’s website. PHOTO CREDITS: The first image featured in this article is a promo image for Portlandia - courtesy of IMDB. The above photo of Oregon’s scenic roads is from the Oregon Film Office’s website.